There will be a special session on RS-enabled EBVs and biodiversity at the International Geoscience and Remote Sensing Symposium (IGARSS) 2018 conference, co-chaired by Prof. Andrew Skidmore, Dr. Nicholas Coops, Dr. Uta Heiden and Dr. Allison Leidner. ! The AGU 2017 fall meeting will be held in New Orleans from 11 – 15 Dec 2017. ! 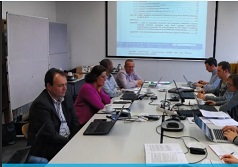 The Requirements Review meeting took place on the 9th-10th November at University of Zurich. !